Various management tools are used by businesses to ensure that their business functions run smoothly. These tools are quite efficient in doing what they are supposed to do and offer business owners key insights into their financial information and business processes. Budgets are one of the most common financial tools that are used by businesses to manage their finances. A budget is created with advanced forecasting tools and is useful in predicting your future expenses. Companies heavily rely on the accuracy of their budget because most of their key decisions are based on it. There are all sorts of budgets, including departmental and company budgets. Performance reports, on the other hand, are generally an assessment of a specific function of a business. However, an overall performance report is also generated at the end of every fiscal tenure. These reports, along with budgets, are extremely critical to every business. Highly professional people should be appointed to work on them, including professional bookkeepers or accountants. 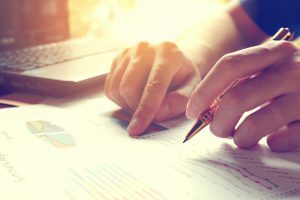 The finance department is usually allotted the task of creating a budget, while a performance report may highlight specific attributes associated with the budget and should be created by an expert. Your current budget is an important indicator of how you should plan your future budget. Based on previous experience, business managers can indicate overspending as well as allocate the proper funds to specific departments. The growth of your business depends on your ability to allocate your budget correctly and efficiently. A budget also helps you determine the number of sales that are required to meet a specific target. You can then allocate your sales resources accordingly so that the target can be achieved. Reviewing the budget and adjacent performance reports helps businesses understand the specific elements in their mode of operation. Tracking a company’s spending is an important aspect of any business. If you do not regulate and control spending, you will soon lose control of your cash flows and negative balances will start popping up. Small things matter, therefore, the expenses need to be checked. A budget can highlight important aspects of your spending. If your expenditures are not resulting in the estimated amount of sales, it is highly likely that your money is not being fully utilized. Performance reports and budgets help you identify these cases of spending variances which are responsible for under utilization of your resources. Therefore, their roles are vital for a business to achieve it’s fullest potential. Though a budget holds a significant amount of key information, it cannot offer you additional information related to budget variances. This information doesn’t necessarily have to be financial and can go outside the realm of budgets. Additional costs of acquiring the resources or poor economic conditions are various factors that need to be considered before a budget is approved. Government changes of laws and regulations related to your specific business are something that can impact your budget and information regarding that is included in performance reports. Some of these indicators are financial while others may completely depend on something else. Therefore, a performance report has to be provided to ensure that there are no surprises in the future. It is suggested that businesses use accounting tools and software for the creation of budgets as they offer a broader picture of your company’s financials. You can view the information in graphs, plots and any other medium of choice which makes it easier to understand. Maintain accurate records from the beginning and uphold them throughout the bookkeeping periods so you do not have to rush at the end. The process is also quick and efficient, therefore, it will save you precious time and resources. You can also hire professional accounting and bookkeeping services that will make highly accurate performance reports and budgets. If you are in doubt or your accounting skills aren’t spot on, always opt for that option. https://www.completecontroller.com/wp-content/uploads/cclogo_main-long-300x63.png 0 0 Complete Controller https://www.completecontroller.com/wp-content/uploads/cclogo_main-long-300x63.png Complete Controller2019-01-09 10:51:582019-01-11 12:11:19What is the Role of Budgets & Performance Reports?